In Australia, our indoor workspaces are now more crowded than ever before. Our population and our economy have grown so much in the last four or five decades that they’re virtually unrecognisable; but in most of our metropolitan areas, we’re still working in the same spaces, ill-equipped as they are. Our indoor air quality is affected by many factors that are still present in our buildings since the energy crisis of the 1970s—including heating, air-conditioning, and ventilating (HVAC) systems that aren’t well maintained, dim lighting, and poor humidity control—and our workers are reporting more and more frequently that they’re unhappy and unwell. There’s been a lot of research into indoor air quality in recent times. And it’s coming from some of the most reputable institutions across the globe—including various Environmental Protection Agencies, NASA, and a collection of highly respected universities. The findings have been shocking: indoor air pollution is making our workers sick and depressed, costing them their quality of life, and costing our businesses tens of billions of dollars a year. Luckily, there’s a simple solution to clearing the air: and it lies within the humble potted plant. 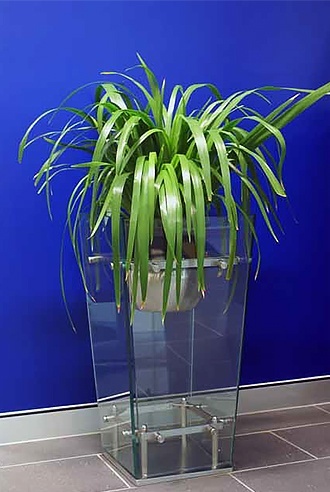 Along with outlining the effects of indoor air pollution, the research is helping to grow a body of evidence that’s inspiring and hopeful in its support of indoor plants—with the right plants in the right places, happier and healthier work environments are within the grasp of all of Australia’s workers. During the 1970s energy crisis, Australia was among the group of nations who were worst affected by elevated prices and lower availability of fuel. Building owners in this period did their best to cope with the economic impact of the crisis by reducing their energy consumption the only way they knew how: by reducing the influence of the outdoor air on their workers. Unfortunately, they didn’t know then what we know now about passive solar design and sustainable design and construction, and their solutions were often simply closing off the workspaces from the outside. These ill-informed decisions are now responsible for a slew of health problems among Australian workers in the same buildings, which are now even more densely populated. The lack of ventilation has been causing a toxic build up of contaminants, which are emanating from the raw construction materials and the paints and finishes in the building, and the equipment that our workers rely on daily. The contaminants are causing myriad complaints, from mild fatigue and discomfort, to debilitating and morbid health conditions—and building owners are now searching for answers to these serious problems. The excessive noise of overcrowding, the mould and mildew, and the build up of volatile organic compounds (VOCs) emitted from materials and equipment are making our work environments unpleasant and unsafe. The indoor air in some of our buildings contains higher levels of pollutants than the air outside does, even in the busiest and smoggiest business centres. Considering that most of our workers spend up to 90 per cent of their time inside, it’s no wonder that we’re now seeing the effects that these pollutants can have on their comfort, productivity, and experience of illness. There’s a lot of evidence supporting the U.S. Environmental Protection Agency’s estimates of the cost of poor indoor air quality—and it’s confronting. Besides the human cost in quality of life, our diminishing air quality is costing us tens of billions of dollars every year in medical care and decreased productivity. Loosely classified as Sick Building Syndrome (SBS), our workers are suffering from allergies and respiratory infections, gastrointestinal upset and nausea, fatigue, depression, diminished concentration, stress, and pain—and a generally lower quality of life as the years go on. Plants are the simplest and cleanest solution to our indoor air quality challenges: they can help us improve our quality of life just by doing what they do. Their natural photosynthesis—converting light and carbon dioxide into chemical energy for growth—gives them the ability to absorb gaseous compounds through their leaves, filtering and removing pollutants from our air as part of their normal function. 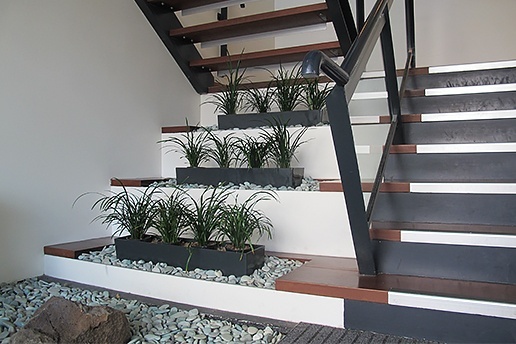 While building owners would do well to remove pollutants from their work environments by improving their ventilation, insulation, and temperature control sources, a lot of the heavy lifting can be done by plants, which act as natural air purifiers. Besides removing carbon dioxide, they also remove volatile compounds like benzene (found in plastic, synthetic fabric, pesticides and cigarette smoke) and formaldehyde (found in cosmetics, detergent, fabric softener and carpet cleaner); it may even be reasonable to expect that, in the years to come, there will be evidence of the role of plants in preventing cancer. 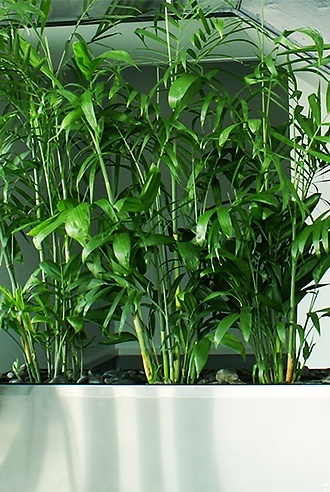 Plants can reduce carbon dioxide levels, heat, noise and VOCs by as much as 10 per cent. And one of the biggest benefits is that just about any plant will do: while scientists at NASA and several reputable American universities have found that some plants—including ferns, palms, ivy, Aloe Vera, and peace lilies—are particularly adept at removing VOCs, there’s not a lot of difference between the all the species in their ability to improve the air quality. Researchers at the University of Technology Sydney have found that this phytoremediation—the ability to mitigate pollution in the air, soil, or water—is so efficient that a single plant in 200mm pot placed in an air-conditioned or closed room can clear the air of VOCs within 24 hours. But if that’s not a good enough reason to embrace indoor plants, buildings can also gain two points from the Green Building Council Australia on the Indoor Environment Quality measure, and improve their reputation for sustainability. 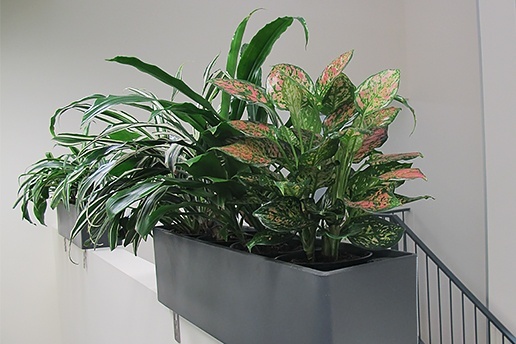 Indoor plants are the best way to improve the air quality in our buildings: there aren’t any by-products or side effects to worry about, they’re visually appealing, and they cost a fraction as much as any man-made device that can only do half as good a job. They’re also easy to maintain, if you leave them in the hands of professionals. 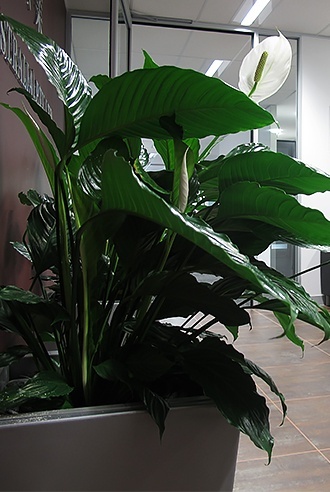 Prestigious Plantscapes’ fully trained plant designers are always available to help you improve your business’s working conditions, with striking designs and sustainable solutions for fresher indoor air. Contact us anytime for more information—we’d love to help you and your workers breathe easier, and work stronger, for a more fulfilling future.